Hello and welcome to our brandnew website. This homepage is under constant construction. So, keep on looking in, for what´s new. We have just received the Award of the German Record Critics (Deutschen Schallplattenkritik) for the third time. After recieving this prestigious award 2010 for our „O Town Grooves“ and 2014 for „X-Ray Blues“ we have now been awarded for our latest production „Ain't nothing but....“. The jury of this award consists of renowned German music critics. The Award is presented quartely in respective categorys. This will be the first time that a band has received the award for three consecutive albums. Here the statement from the Jury…. Our good friends, K.P & M.A. Thiemann , have released Silent Night ,Red Blood and an interview with Tosho and Mike on Youtube...in stereo and first class audio. Thanx. The NDR network recorded our release party at the Blue Note Club. The report will be on air 22 March at 11pm on „Kulturjournal“ NDR3. „The best Blues is from Osnabrück – Blues Company's new album. Germanys most successful and longest standing Bluesband has been on the road since over 30 years with classic down home Blues present their new album „O'Town Grooves, O'Town being a short form for Osnabrück, a town name most american artists who have worked with the Blues Company over the years had trouble to pronounce. The „Kulturjournal“ will be bringing a portrait of Bandleader and founder Tosho Todorovic. We are proud to announce that „O'Town Grooves has recieved the German Record Critics Award in the category Jazz & Blues. Are we proud? Yes we are!!!! Blues Louis for Toscho !!!!! Tosho has been elected to recieve Germany's most prestigious Blues award, the „Blues Louis“ (named after Louis Armstrong), at this years Lahnstein Bluesfestival on the 24-24. September. 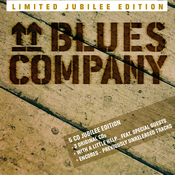 Blues Company Double „Best Of“ Cd has arrived. Both „Best Of CD's - „Blues Ballads and Assorted Love Songs“ , together with „More Blues Ballads and Assorted Love Songs“ for an unbeatable price. Best choice for all new fans who wish to catch up on the band's past 20 years. On the 10.08. we helped organise a charity concert for the local music schools. The event was a great success, gathering in well over 10 000 € donations. The money will be used to purchase Rock 'n Roll instruments for kids who cannot afford instruments for themselves, giving them the chance to persue a creative hobby. The band was very busy. At the end of September our new double CD will appear. The „2 in 1 Collection“ consists of our Best of CDs, „Blues Ballads And Assorted Love Songs“ and „More Blues Ballards And Assorted Love Songs“, being the definate collection of the finest Blues CO. Songs of the last 22 years. We have been working on our next CD since the beginning of the year. It will be released in Febuary 2010. Over the last months we have presented most of the new songs live at our concerts and let the fans applause decide which songs make it onto the album. Most of the material is on tape and I'm very enthusiastic about the results. We have managed to capture almost all styles of modern Blues from solid Blues Rock and emotional ballads, over to Soul and R&B dance tunes. Most of the songs were recorded with double bass, presenting a new warm sound that is sure to catch the ear of our audiophile freinds, giving them something to look forward to. We are planning to invite some freinds to take solos on some tracks. We cannot disclose more at the moment, but in the end some very famous names should be among the credits. Arny Ordodnik has recieved a Marauszczyk Bass endoresmemt. At the moment, a custom „Jake“ model is being built to Arny's exacting specifications.